For those pet owners; for those who have loved and lost; this post is for you. And for me. And for my family. Our almost 8 year old Golden, Oliver, suddenly passed away over the weekend, Sunday October 26th at 1:30, to be exact. For those who have never owned a pet, this surely seems like a blip on the radar. But for those who just read the 5 sentences above and now have a lump in your throat knowing the inexplicable void that losing a pet creates, you get it. Thank you. Despite my grief right now, every one of Oliver's days were marked by unconditional love and fab memories. He was a fantastic pup. Named after the Naked Chef, Jamie Oliver. For the first few days, he was "Monroe", then for one day, "Jackson". Neither fit. As the credits rolled after a swell Naked Chef episode on Food Network, "Oliver" jumped out at me. 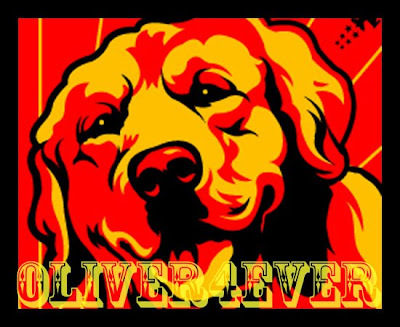 Our Oliver was a lot like Jamie Oliver: likable to a fault- in a sweet fumbling, bumbling way. The breeder's grounds were so questionable that I called my parents in OHIO and told them where we were and if they didn't hear back from me in a hour to call the police. Kid you not. But the breeder was a likable gent and the pups were gorgeous. They lived in better conditions than that owner did. We had Oliver loaded in the car, were about to leave when I made small talk that I worked for marchFIRST in Irvine therefore I could go home and check on Oliver throughout the day. The most unexpected thing happened: the breeder ran, and I mean RAN into his home/trailer/construct and reappeared waiving papers at me. Here he was also ... dramatic pause... a day trader! And one who proceeded to ask ME (in a fairly high pitch that was scaring the dogs) if I knew if HE should sell or keep his stocks, and his clients'. Upon re-read, guess you had to be there. But it was surreal. Much like the demise of marchFIRST. Strangely, all month I intended my last post for October to be about 'wolves', as the concept has a nice tie in w/Halloween coupled with the fact that I have an inexplicable amount of songs that are 'wolf' related-either in title, subject matter or band name. But instead of wolf, I am going the canine route. Oliver deserves first billing. It has taken me all week to compose this playlist... I will miss him beyond description. Where my Berner Jonah is my protector, Oliver was the Lover. The quintessential Golden: always at the ready to snuggle, to kiss, and just be where ever the family (or food!) was. Mister M's reaction was golden (every pun intended). After he had a moment to digest the news, he paused, looked up at me and asked, "Mommy, will we have calling hours for Oliver? "It was nice to take a break from the tears and have a good belly laugh at that one. Goddamn, I will miss you Oliver. You rest in peace, my pup. My sister read/saw a saying about dogs many years ago and repeats it so often that we hold it as doctrine. While I can't recall the words verbatim, it essentially states 'never pass by your dog without petting him'. In our busy life, it is/was so easy to just breeze past the dogs onto wherever I needed to be. But more often than not, I am happy to report that I would put my ol self in reverse and go back to give a pat on the head, tummy, or a kiss, and say their names affectionately. I am glad I made the time to do so. If you have a pet, please make the time. You will never regret it. N O T E: click on the square gray 'play' button next to song title to listen. Nice indeed. Since my boy was a Golden, this song came top of mind immediately. This live version is from the Startime Pavillion. While I love the studio version on iTunes (as the instrumentals just carry you away) Jim James' voice is more pure and equally equipped to take you on a personal journey in this live version. In honor of Oliver's faux british pedigree linked to Jamie Oliver, I post this gem from Kind Hearts and Coronets. I love the change in tempo @1:40. Rather light spirited, as was Oliver. Just a perfect summation: totally, utterly, painfuly blindsided. Great song. More incredible in this live version. Trust me. Just passion driven. Man, love the piano in this song. Just sad, sappy, dripping lyrics. Feels like old school Loggins + Messina via the harmonies. I am sure to post about this song again. The lyrics are pure: "Have you seen my ghost?" Oliver's enormous tufts of fur will be wonderfully ingrained in the fabric of our household for many more months (literally-he shed a ton). And the lover of all things ice cubes... it will be hard to pull open our freezer drawer without expecting to see/hear him eager for a frozen delight. I have only listened to this song once. It was shared w/me on a day when a young family friend had just passed away so the lyrics, "Please remember me, happily" just struck a nerve which prevented me from listening to it ever again. However, I do know it's a beautiful song. The lyrics read so. And perfect for this tribute playlist. Oliver did spend a lot of time in the kitchen. Just hangin' out with the w/fam. As such he spent a lot of time listening to great music as I've stated in the past-we always have music playing in the kitchen. This gem is a twist on my feelings and perhaps a nod to Oliver's propensity for down tempo jazz. Cool pooch, huh? Ever the optimist, I will find good in this bad. I need to. Just that simple A classic like this one certainly will help bolster me along. I love the vibe of this song. Makes you feel like you are there in the moment of the recording. Reminds me of La Cave in Costa Mesa. The would-be-a-dive-if-it-weren't-so-cool kind of restaurant in The OC that you could have a great steak, an insanely stiff pour, and still smoke (I don't, btw... but man, the smokers there lived it up large) and of course listen to some great jazz in the tiniest of spaces. This song represents what I hope Oliver is experiencing now: a free feeling. At peace. October 4th is the international day of the Blessing of Animals set forth by St. Francis, Patron Saint of Animals. We missed it. And truth be known, how and where we would have schlepped two 90 lbs dogs to get blessed would have been beyond my Google prowess. But I am pleased knowing there is a day where animals are held in sanctimonious regard. By some counts they are the closest thing we have to God as we accept them and they accept us without conditions.